The Safety Turtle is reliable yet simple: worn as wristband (or attached to a dog or cat’s collar), the Safety Turtle 2.0 will alert you the moment it is submerged. So if your child has fallen into the pool, you will know—and you can act. The product is permanently sealed and ruggedly built to withstand child’s play. Rain or spray from lawn sprinklers will not trigger the alarm. One base station can support an unlimited number of wristbands or collar attachments for pets. Be smart, be safe, be sure—get Safety Turtle 2.0 today to protect and empower your family against drowning. Drowning can happen easily—prevention should be easy too. The system is easy to use: secure the Turtle to your child’s wrist or pet’s collar, set the base within 200 feet of the pool and plug it in. You’re ready! One base alarm can support unlimited Turtle wristbands and collar attachments, for additional children and pets. All Safety Turtle products come with a one-year warranty. 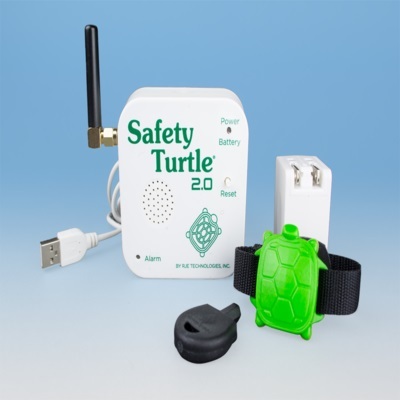 The Safety Turtle 2.0 Pool Alarm Child Kit is a pool alarm system designed for your child’s safety.